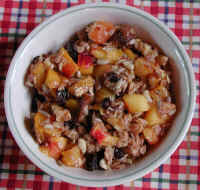 Peach crisp is a relarively easy to prepare vegan recipe for breakfast, dessert, or for a shack. It makes 4 servings and takes about 10-15 minutes to prepare and cookes in 7 to 10 minutes in a microwave oven. Wash and clean the ripe peaches, cut into bite-size pieces and place 2 cups of the peach pieces in a covered glass microwaveable or oven-safe baking dish. Add the rolled oats and cinnamon and mix thoroughly. Cook in a microwave oven for about 5 minutes on "high", or in a preheated conventional oven at 350 degrees F. until the oats are softened. The juice from the cooking peaches will provide the moisture for cooking the oats. While the oats and peaches are cooking, cut the dates and figs into small pieces. 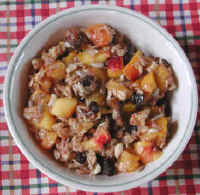 Remove the peach-oat mixture from the oven and add the raisins and cook for another few minutes. Remove from the oven and add the remaining peaches, dates, figs, sunflower seeds, and walnuts. Mix thoroughly and serve.